The purpose of this module is to create awareness of the bleeding disorders GAVE and Radiation Proctitis, discuss why they occur and explore the treatment options available to patients. We will review the basic definition of each disorder, followed by an in depth discussion of the clinical implications and therapeutic options available for patients. Exactly what is GAVE? The technical name for this condition is gastric (stomach) antral (the end part of the stomach) vascular (blood vessel) ectasia (dilated blood vessels), otherwise known as GAVE and first described in the literature by Rider et al. in 1953. These dilated blood vessels may leak or rupture, causing intestinal bleeding. 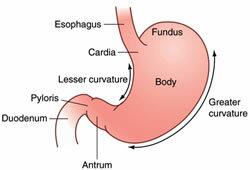 As the name implies, the disease generally manifests itself in the distal portion of the stomach, the antrum. The typical appearance of GAVE consists of visible columns of red, dilated vessels which course along the longitudinal folds of the antrum. 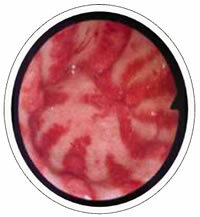 This appearance has been likened to the stripes on a watermelon rind, hence the term “watermelon stomach”, another name for the condition, coined by Jabbari et al. in 1984. Although GAVE is considered a rare medical condition, it accounts for up to 4% of all non-variceal upper gastrointestinal bleeds. Typical initial presentations range from occult bleeding causing transfusion-dependent chronic iron-deficiency anemia to severe acute upper-gastrointestinal bleeding. Most patients with GAVE suffer from chronic medical conditions which are thought to be causally related to it. Cirrhosis of the liver is found in 30% of GAVE patients. Data obtained from screening gastroscopies on patients undergoing liver transplantation suggest that 1 in 40 patients with end stage liver disease has GAVE. Overall, GAVE is found more frequently in females. The majority of non-cirrhotic GAVE patients are females (71%), with a mean age of 73 years, whereas cirrhotic GAVE patients tend to be younger (mean age 65 years) and male (75%). In non-cirrhotic patients with GAVE, autoimmune diseases are most common, with incidences of 62% for autoimmune connective tissue disorders, 31% for Raynaud's phenomenon and 20% for sclerodactyly. Other conditions described in GAVE patients include scleroderma, chronic renal failure, ischemic heart disease, hypertension, valvular heart disease, familial Mediterranean fever and acute myeloid leukemia. Patients often seek medical attention based on their symptoms, such as chronic fatigue, melena (black tarry stools), vomiting of blood (bright red or with the appearance of coffee grounds). The diagnosis is then based on the clinical history, endoscopic appearance, histological changes of gastric tissue samples as described by a pathologist, and blood work. 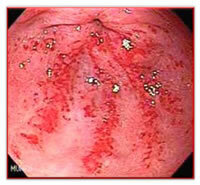 GAVE is characterized by dilated blood vessels within the stomach's mucosa and submucosa. The abnormal tissue can bleed profusely, which results in the patient’s experiencing iron deficiency, requiring repeated transfusions.